Background and objectives Hepatitis C virus infection is common in patients with CKD and leads to accelerated progression to ESRD. Sofosbuvir is a potent direct-acting antiviral therapy against hepatitis C virus; however, there are concerns about its safety in patients with CKD. The objective of our study was to determine the safety and efficacy of sofosbuvir in patients with CKD. Design, setting, participants, & measurements We studied a retrospective observational cohort of patients with CKD defined by eGFR<60 ml/min per 1.73 m2, ≥30 mg albuminuria per 1 g creatinine, or ≥200 mg proteinuria per 1 g creatinine who received sofosbuvir-based therapy in a large health care system. Regression models were constructed to predict likelihood of sustained virologic response, detect adverse events, and examine changes in eGFR from baseline to follow-up. Results Ninety-eight patients with CKD (42% stage 1 or 2 CKD and 58% stage 3 CKD) were included. Mean age was 62 years old, 78% were men, and 65% were white. Additionally, 49% of patients had diabetes, 38% of patients had cirrhosis, and 33% of patients had prior solid organ transplant. Overall sustained virologic response was 81% and varied by regimen used and viral genotype. Average baseline eGFR was equivalent to average on-treatment eGFR, but seven patients experienced a rise in creatinine ≥1.5 times baseline while taking sofosbuvir; all but one recovered. In patients with eGFR<60 ml/min per 1.73 m2 at baseline (stage 3 CKD), regression models showed that hepatitis C cure was associated with a 9.3 (95% confidence interval, 0.44 to 18) ml/min per 1.73 m2 improvement in eGFR during the 6-month post-treatment follow-up period. Adverse events were common (81%), but serious adverse events (17%) and treatment discontinuations (8%) were uncommon. Conclusions Sofosbuvir-based direct-acting antiviral therapy is safe and effective in a cohort of patients with CKD infected with hepatitis C.
Hepatitis C virus (HCV) infection, the most frequent chronic viral infection in the United States, is a common comorbidity in patients with CKD (1,2). Glomerular abnormalities in HCV are common and may be under-recognized; they have been reported in up to 85% of patients with cirrhosis from HCV (3,4). HCV infection is associated with higher risk of incident CKD, faster eGFR decline, and higher risk of ESRD and death (5). Despite the strong epidemiologic link between HCV and CKD progression, the overwhelming majority of patients with CKD infected with HCV remain untreated, because they have historically been difficult to treat due to frequent adverse effects associated with IFN, ribavirin, and first generation protease inhibitors (6–10). Fortunately, novel direct-acting antiviral therapies are more effective and cause fewer side effects than earlier therapies (11–13); however, data on their use in CKD remain sparse. Sofosbuvir, a first in class NS5B nucleotide HCV RNA polymerase inhibitor, revolutionized the management of HCV; real-world data show that over 90% of patients with genotype 1 infection who are treated with sofosbuvir-based regimens will achieve sustained virologic response, which is currently synonymous with cure of HCV infection (14,15). However, the active metabolite of sofosbuvir, GS331007, is eliminated by the kidney, and sofosbuvir was only studied and approved in patients with eGFR>30 ml/min per 1.73 m2. Levels of sofosbuvir and GS331007 are substantially higher in patients with severe kidney impairment or ESRD. More recently, concerns about potential nephrotoxicity have been raised, particularly in patients with preexisting CKD (16). The aim of this study was to determine the real-world safety and efficacy of sofosbuvir-based direct-acting antiviral therapy in patients with early-stage (1–3) CKD who were treated in our health care network, particularly focusing on on-treatment and post-treatment changes in eGFR. This is a retrospective observational cohort study at Partners Healthcare in Boston, Massachusetts. Patients were identified by query of the Research Patient Data Repository, and a subset received direct-acting antiviral therapy at a Partners Healthcare site between November of 2013 and December of 2014. The Research Patient Data Repository at Partners Healthcare is a centralized data registry that gathers clinical information on patients seen in the Partners Healthcare system. After being identified, all charts of sofosbuvir-treated patients were reviewed to determine the accuracy of CKD diagnosis and that at least one dose of sofosbuvir was taken by the patient. CKD was defined by eGFR<60 ml/min per 1.73 m2, ≥30 mg albuminuria per 1 g creatinine, or ≥200 mg proteinuria per 1 g creatinine (17). Comorbid conditions were determined by chart review. Hypertension was defined as BP>140/90 mmHg on at least two visits in the year before treatment initiation or receipt of an antihypertensive medication. Diabetes was defined by hemoglobin A1c value >6.5% or receipt of any antidiabetic medication. History of alcohol and drug use was on the basis of provider documentation. Patients were considered to have cirrhosis on the basis of liver biopsy findings (Metavir stage 4 or Ishak stage 5 or 6), or in the absence of liver biopsy, cirrhosis was defined as any two of the following criteria: platelet count <140,000/μl; presence of esophageal varices on esophagogastroduodenoscopy; or evidence of cirrhosis and/or portal hypertension and/or ascites by imaging studies, FibroSure, or transient elastography (Fibroscan) result compatible with Metavir stage 4 fibrosis (18,19). Race was determined by self-report. Direct-acting antiviral therapy was prescribed at the discretion of the treating physician; treatment regimens depended on the genotype, presence of cirrhosis, and prior treatment experience. Patients were treated with a sofosbuvir-based regimen approved before January 1, 2015—other agents used included simeprevir (second generation NS3/4A protease inhibitor) or ledipasvir (NS5A inhibitor) with or without ribavirin. Patients were excluded if they also received IFN (n=4). Sustained virologic response (cure of HCV) was defined as an undetectable HCV RNA at least 12 weeks after the completion of therapy (20). Baseline kidney function was determined by averaging all outpatient creatinine values available in the electronic medical record in the 3 months before starting direct-acting antiviral therapy. Patients who did not have any baseline values during this 3-month period had all values included up to 12 months before starting direct-acting antiviral therapy (n=10). eGFR was calculated using the CKD Epidemiology Collaboration equation (21). During direct-acting antiviral treatment, all creatinine values, including inpatient values, were recorded. We performed an a priori subgroup analysis on patients with baseline eGFR <45 ml/min per 1.73 m2 compared with those with eGFR≥45 ml/min per 1.73 m2 to determine if average on-treatment creatinine changes differed by baseline eGFR (16). Post-treatment kidney function was determined by averaging all outpatient creatinine values available in the electronic medical record in the 6 months after completing direct-acting antiviral therapy. Adverse events (AEs) were determined by chart review by two study investigators (M.E.S. and E.B.) who were aware of prescribed treatment. Every clinical note (including visits and telephone documentation) was reviewed to determine any new or worsening complaints from the time of treatment initiation until 4 weeks after treatment completion. Laboratory values obtained during treatment and 4 weeks after treatment completion were reviewed to determine new or worsening laboratory abnormalities. A grade 3 or higher abnormality according to the Common Terminology Criteria for Adverse Events was considered a serious adverse event (SAE) (22). Clinical symptoms were considered SAEs if they warranted admission to the hospital. Baseline characteristics of patients were described using mean±SD or percentage. Baseline and follow-up eGFRs were compared using paired samples t tests. A logistic regression model was used to determine baseline factors associated with sustained virologic response and changes in eGFR during therapy; odds ratios and 95% confidence intervals were used to summarize the results of this model. A multivariable linear regression model predicting change in eGFR after therapy included adjustment for clinically relevant baseline characteristics and any other variables that were significant to the level of 0.2 in univariate models. Because a previous study suggested that advanced CKD, defined as eGFR<45 ml/min per 1.73 m2, is associated with increased risk of AKI events in patients on sofosbuvir, we a priori chose to investigate changes in eGFR while on sofosbuvir-based therapy in patients with baseline eGFR <45 ml/min per 1.73 m2 compared with those with eGFR ≥45 ml/min per 1.73 m2 (16). All analyses were performed with Stata, version 13.1. A two-sided P value of <0.05 was considered to indicate statistical significance. The Institutional Review Board at Partners Healthcare System approved this study and waived the need for informed consent. Overall, 404 patients were identified with stage 1–3 CKD and HCV (Table 1). Ninety-eight patients had been prescribed a sofosbuvir-based regimen and were included in the main analysis. Compared with treated patients, untreated patients (n=306) were more likely to be women, be nonwhite race, and have an eGFR<60 ml/min per 1.73 m2; they were less likely to have cirrhosis or a prior solid organ transplant. Baseline characteristics of the overall treated cohort are shown in Table 1. Mean (SD) age was 62 (9) years old. The majority (78%) were men; 65% were white non-Hispanic, and 19% self-identified as black. Comorbidities were common and included hypertension in 88%, diabetes in 49%, and cirrhosis in 38%; 9% were coinfected with HIV. Thirty-two patients (33% of the cohort) had previously undergone solid organ transplant: 20 received a liver transplant, eight received a kidney transplant, and four received both a liver and a kidney transplant. Baseline mean (SD) viral load was 4.4×106 (5.8×106) IU/ml. Distribution of genotypes is shown in Table 2. Average baseline serum creatinine was 1.3 (0.3) mg/dl, corresponding to eGFR=60 (20) ml/min per 1.73 m2. Forty-one patients (42%) of the cohort had stage 1 or 2 CKD defined by proteinuria with eGFR>60 ml/min per 1.73 m2, and 57 patients (58%) had stage 3 CKD (eGFR<60 ml/min per 1.73 m2). Direct-acting antiviral regimen selection was on the basis of the patient’s genotype; prior treatment history; presence or absence of cirrhosis; and provider, patient, and payer preferences. Providers followed guidelines from HCVguidelines.org, which evolved over the study period with the approval of ledipasvir/sofosbuvir in October of 2014. The efficacy of regimens, by genotype, is shown in Table 2. Overall, patients with genotype 1b responded most favorably, with 89% achieving sustained virologic response compared with 83% with genotype 1a infection. Twelve of 14 (86%) with genotype 2 infection achieved sustained virologic response. Those with genotype 3 or 4 were less likely to be cured, with only 43% and 60% achieving sustained virologic response, respectively, although numbers were small (Table 2). We found that patients with more advanced CKD were more likely to be cured with direct-acting antiviral therapy. In a multivariable model including a priori clinical characteristics known to predict sustained virologic response, each 10-ml/min per 1.73 m2 decline in baseline eGFR was associated with a 1.7-fold increased odds of sustained virologic response (95% confidence interval, 1.3 to 2.4); a second model only using P<0.20 variables was used and yielded similar results (Table 3). Ninety-three patients (95% of cohort) had at least one serum creatinine measured while on direct-acting antiviral therapy. On average, patients had four creatinine measurements obtained on therapy. Average eGFR in the 3 months before beginning direct-acting antivirals (baseline eGFR) was equivalent to average eGFR during the entire treatment period: baseline 60±20 ml/min per 1.73 m2 compared with 60±21 ml/min per 1.73 m2 on treatment (P=0.90). Patients experienced minor fluctuations in creatinine while on therapy; the majority (74%) had stable kidney function, and creatinine did not rise ≥0.3 mg/dl from baseline at any time during treatment. 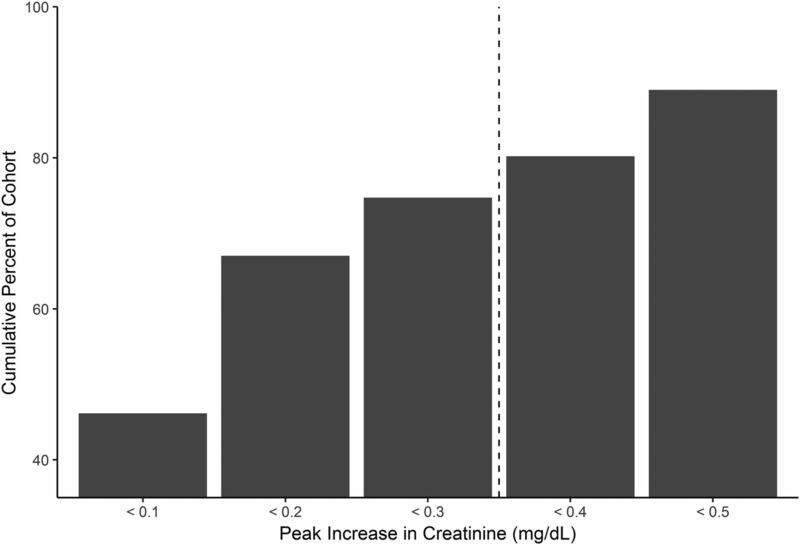 The peak rise of serum creatinine from baseline to the highest measurement on treatment is shown in Figure 1. A model of the clinical predictors of significant creatinine rise (≥0.3 mg/dl) on therapy is in Supplemental Table 1; in the multivariable models, diabetes and baseline eGFR significantly predicted the development of a significant creatinine rise on therapy. There were seven events with creatinine rising ≥1.5 times above baseline while on therapy; each AKI event was not deemed by the providers to be related to sofosbuvir use. The creatinine improved to within 0.3 mg/dl of baseline after treatment in all patients, except for one patient who died during hospitalization from hepatic encephalopathy. Deidentified patient summaries are provided in Supplemental Table 2. The majority of the cohort had stable renal function while on sofosbuvir-based hepatitis C virus therapy. Bar graph represents the percentage of patients who experienced a maximum rise in serum creatinine in the above ranges. The majority (75%) of patients had stable kidney function (<0.3 mg/dl) rise in creatinine during sofosbuvir therapy. When evaluating only those with advanced CKD (eGFR<45 ml/min per 1.73 m2; n=24) compared with those with eGFR≥45 ml/min per 1.73 m2 (n=74), we found that all other baseline characteristics between the two groups were similar (Table 1). The group with advanced CKD had more frequent blood collections, with an average of 5.6 (5.2) creatinine values measured during sofosbuvir-based direct-acting antiviral therapy compared with 3.8 (2.8) in those with eGFR≥45 ml/min per 1.73 m2. Average eGFR during the on-treatment period (the 12–24 weeks while the patient was taking sofosbuvir-based therapy) was stable at 40 (10) ml/min per 1.73 m2 compared with baseline eGFR of 38 (5) ml/min per 1.73 m2. In fact, compared with patients with eGFR ≥45 ml/min per 1.73 m2, those with more advanced CKD experienced a smaller change in eGFR, dropping by only 3.8 (8.9) ml/min per 1.73 m2 on average during therapy compared with an average of a 6.4 (11.1)-ml/min per 1.73 m2 decline in nadir eGFR on therapy for those with eGFR>45 ml/min per 1.73 m2, although this difference was not statistically significant (P=0.29). Raw data (baseline eGFR, average on-treatment eGFR, and post-treatment eGFR) for each patient with eGFR<45 ml/min per 1.73 m2 are shown in Supplemental Figure 1. Only one patient (4%) with baseline eGFR <45 ml/min per 1.73 m2 experienced a >1.5-fold increase in serum creatinine while on treatment (Supplemental Table 2). Ninety-five of the patients (97%) had at least one serum creatinine measured after completing direct-acting antiviral therapy in the post-treatment follow-up period (6 months). There was no significant change in post-treatment eGFR compared with baseline eGFR associated with sustained virologic response in patients with stage 1 or 2 CKD (Table 4). However, in those with baseline eGFR <60 ml/min per 1.73 m2, a multivariable model including variables known to associate with CKD progression showed that sustained virologic response was associated with a 9.3-ml/min per 1.73 m2 (95% confidence interval, 0.44 to 18) improvement in eGFR in the post-treatment follow-up period (P=0.04) (Tables 4 and 5⇓). In the cohort with stage 3 CKD, stratification by diabetes status revealed that patients with diabetes continued to experience eGFR decline despite direct-acting antiviral treatment, whereas patients with nondiabetic CKD had a 4.5 (9.1)-ml/min per 1.73 m2 increase in eGFR over the same time period (P=0.01). AEs were common during treatment, with 79 patients (81%) reporting at least one new or worsened symptom while on direct-acting antivirals or within 4 weeks of completing therapy. AEs reported by >10% of the cohort are shown in Figure 2. The coadministration of ribavirin was associated with an increase in the odds of AEs during treatment. AEs occurred in 97% of ribavirin users versus 28% of those whose regimen did not include ribavirin (odds ratio, 11.9; 95% confidence interval, 1.5 to 93; P=0.02). With the exception of photosensitivity, a known side effect of simeprevir, all other AEs were more common in patients receiving ribavirin. 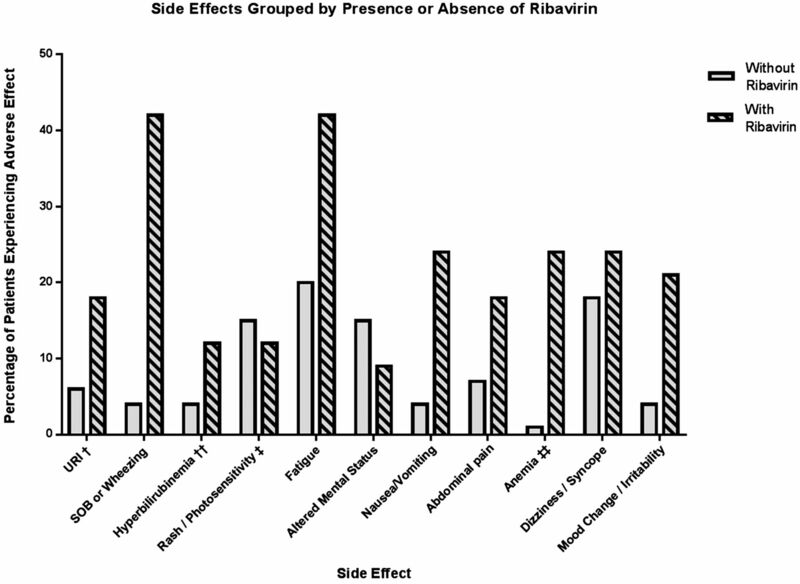 Adverse effect in those treated with ribavirin versus ribavirin-free regimens. †URI included complaints of nasal congestion, sore throat, and cough not associated with shortness of breath. ††Hyperbilirubinemia was defined by an increase of serum total bilirubin to greater than or equal to two times the upper limit of normal. ‡Of the six patients who had photosensitivity, all were on simeprevir. ‡‡Anemia was defined by either a decline in hemoglobin of 2.5 g/dl from baseline or hemoglobin level dropping below 8 g/dl. URI, upper respiratory infection; SOB, shortness of breath. SAEs occurred in 17% of the cohort; however, only 8% discontinued therapy. Patients taking ribavirin had 2.9-fold increased odds of experiencing an SAE (P=0.03). There were two deaths. One patient had a history of diabetes, hypertension, and atrial fibrillation on warfarin therapy; his baseline creatinine was 1.4 mg/dl. Three days after starting sofosbuvir and simeprevir, he developed hemorrhagic shock from a bleeding gastric ulcer and had AKI with creatinine peaking at 3.6 mg/dl. He was treated with photocoagulation and fluid resuscitation, and he recovered; his discharge serum creatinine was 1.3 mg/dl. He then died suddenly at home 3 days after discharge; autopsy revealed death due to acute atherosclerotic plaque rupture. The second patient had a history of a prior liver transplant with allograft cirrhosis. He was admitted 1 week after beginning direct-acting antiviral therapy with jaundice, altered mental status, and AKI and died of liver failure after >1 month in the hospital. A summary of SAEs is provided in Supplemental Table 3. Diabetes and ribavirin use were associated with SAEs; baseline eGFR was not (Supplemental Table 4). This study confirms that sofosbuvir-based direct-acting antiviral therapies for HCV infection are effective in patients with stages 1–3 CKD, with sustained virologic response rates that mirror those observed in other real-world cohorts (16,23). Patients with genotype 3 or 4 had suboptimal treatment response (Table 2). Fortunately, sofosbuvir-velpatasvir was recently approved for genotypes 1–6, and registry trials have shown a 95%–99% sustained virologic response rate with this regimen (24–25). This is the first study that has specifically evaluated the effects of sofosbuvir-based direct-acting antiviral therapy on eGFR in a population with CKD. We found that patients with more advanced CKD were more likely to achieve HCV cure with direct-acting antiviral therapy, with every 10-ml/min per 1.73 m2 decrease in baseline eGFR associating with a 1.7-fold increased odds of achieving sustained virologic response. The reason for increased efficacy of direct-acting antiviral therapy in patients with lower eGFR is perhaps due to higher drug exposure to antiviral medications eliminated by the kidney. However, it is important to note that this analysis was on the basis of only a few individuals who were not cured. Other studies have not shown statistically significant differences in sustained virologic response rates in patients with CKD compared with those without CKD (16). We found that direct-acting antivirals were reasonably well tolerated, with only 8% of patients discontinuing therapy due to side effects. This rate of discontinuation is higher than that in other studies (27); however, ribavirin use significantly influenced the rate of AEs in this cohort of patients with CKD. Although one quarter of the cohort experienced a rise in creatinine ≥0.3 mg/dl, more significant nephrotoxicity was rare. Furthermore, although small fluctuations in creatinine on treatment were common, the average eGFR while on direct-acting antivirals was stable. Changes in nadir eGFR on therapy are smaller than reported for prior HCV therapies: patients receiving telaprevir (a first generation HCV protease inhibitor) showed an average of a 15-ml/min per 1.73 m2 decline in eGFR during treatment (7). Finally, there was no detectable effect of the degree on CKD on the rate of AEs. The degree of kidney insufficiency did not significantly increase the risk of adverse kidney events or rates of SAEs, although numbers are limited (Supplemental Table 3). Despite concerns that the active metabolite of sofosbuvir accumulates in kidney failure, there has been limited evaluation of its use in patients with CKD. Prior analysis of the Hepatitis C Virus Therapeutic Registry and Research Network (HCV-TARGET) database showed that episodes of worsening kidney function (defined by AKI diagnosis codes) were more common in patients with eGFR≤45 ml/min per 1.73 m2 compared with a reference group with eGFR>45 ml/min per 1.73 m2 (16). However, this analysis relied on AKI diagnosis codes provided by treating physicians and did not evaluate on-treatment and post-treatment creatinine changes. In contrast, our study detected that patients with lower eGFR, on average, tended to have smaller declines in eGFR on therapy compared with patients with eGFR≥45 ml/min per 1.73 m2. Our findings likely differ compared with those from the HCV-TARGET database, because we report creatinine-based data, and they relied on AKI diagnosis codes. Fluctuations in creatinine correspond to smaller changes in eGFR in the lower range of creatinine clearance, and many of these fluctuations did not seem to be clinically significant; however, our follow-up was short term. Additionally, patients with advanced CKD are likely to be more closely monitored than those with eGFR≥45 ml/min per 1.73 m2, leading to increased detection and report of AKI events. Finally, our study suggests the potential for kidney benefit in patients with CKD who undergo direct-acting antiviral treatment and achieve sustained virologic response. However, our conclusions are limited by the fact that there is no untreated control group. Larger studies will be needed to determine if eradication of HCV with direct-acting antiviral therapy slows or prevents progression to ESRD in patients with CKD and HCV. This study has several limitations. First, the limited number of treated patients in this series limits the power, particularly for subgroup analyses. Our finding that eGFR improvement was associated with sustained virologic response in patients with reduced eGFR at baseline, although statistically significant, had wide confidence intervals and will need to be validated in larger cohorts of patients with CKD. The fact that all data were retrospectively collected may have led to under-reporting of side effects; however, we reviewed every clinical note and included all reported symptoms, even if the patient and the provider did not feel that they were associated with direct-acting antivirals. The inclusion of patients with CKD defined by either eGFR or proteinuria allows for a more inclusive definition of CKD than prior studies; however, assessments of proteinuria were not available before and after therapy for the majority of patients. Therefore, we are unable to quantify the effect of direct-acting antiviral therapy on proteinuria. Furthermore, only a minority of patients infected with HCV ever undergo quantitative proteinuria assessment; thus, it is likely that there are more patients with HCV and stage 1 or 2 CKD than we identified. The etiology of CKD was not known in most patients, because very few patients had previously undergone kidney biopsy; however, this makes our findings generalizable to similar populations of patients with HCV and CKD who undergo direct-acting antiviral therapy. This study is limited to patients with eGFR≥30 ml/min. It is important to note that current labeling of sofosbuvir excludes patients with eGFR<30 ml/min; however, recent studies suggest that patients with advanced CKD and on dialysis may be successfully and safely treated with elbasvir-grazoprevir if they have genotype 1 or 4 infection (28). In conclusion, sofosbuvir-based direct-acting antiviral therapy is effective in patients with stages 1–3 CKD. Although adverse effects are common, serious adverse effects and treatment discontinuations are rare. Kidney function remained stable on therapy. Significant AKI events were rare, and all resolved, except in one patient who died from causes unrelated to direct-acting antiviral treatment. Future studies are needed to determine predictors of kidney recovery with HCV eradication and confirm the long-term effects of HCV eradication on kidney function. M.E.S. received research grant funding to the institution from Gilead Sciences, Abbvie, and Merck and was a scientific advisory board participant for Abbvie and Merck. J.W. was a scientific advisory board participant for Gilead. A.Y.K. was a scientific advisory board participant for Bristol Myers Squibb. R.T. was a scientific advisory board participant for Merck. R.T.C. received research grants to the institution from Gilead Sciences, Abbvie, Merck, Bristol-Myers Squibb, and Janssen. Preliminary analyses of the data were presented in abstract form at the American Society of Nephrology Renal Week in San Diego, California, November 3–8, 2015 and in Chicago Illinois, November 15–20, 2016. Supported by the National Institutes of Health grants U19 AI082630 and K24 DK078772. See related editorial, “Contemporary Management of Hepatitis C in Patients with CKD,” on pages 1563–1565. This article contains supplemental material online at http://cjasn.asnjournals.org/lookup/suppl/doi:10.2215/CJN.02510317/-/DCSupplemental. National Institute of Allergy and Infectious Diseases (NIAID). Safety Reporting and Pharmacovigilance. Toxicity Tables: Division of Microbiology and Infectious Diseases (DMID) Adult Toxicity Tables - Draft. November 2007. Available at: https://www.niaid.nih.gov/sites/default/files/dmidadulttox.pdf Updated December 1, 2016. Accessed February 22, 2017.